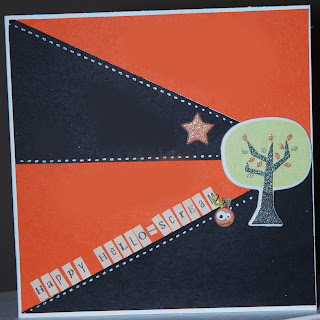 CardMonkey's Paper Jungle: A Week's Worth of Cards: Day 2 - Happy Hello-Scream? A Week's Worth of Cards: Day 2 - Happy Hello-Scream? Does your family have your own language for certain words? We call the whipped cream that comes in an aerosol can, "Fooshie." 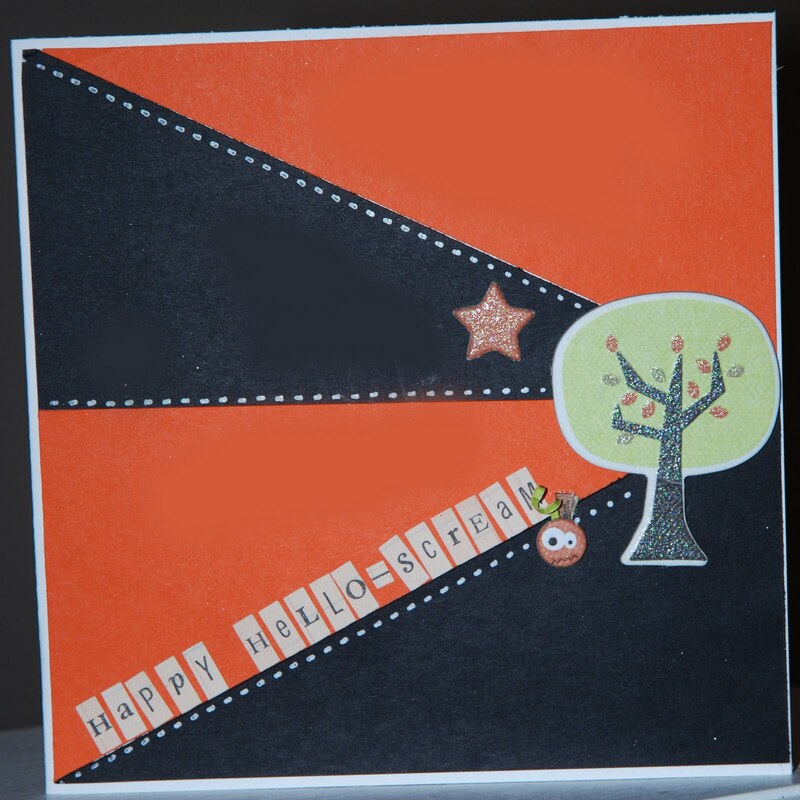 Years ago, a young neighbor friend insisted that the holiday we celebrate on October 31 is "Hello-Scream", not Halloween. She said it derives from the fact you ring the doorbell, and when a homeowner answers, you SCREAM!! Makes perfect sense to me! I was amused then, when I saw Hello-Scream given its place on the cardmaker calendar when a card is featured on the front cover of this month's PaperCrafts magazine! So this card honors that holiday. Interestingly, it's also made only with true scraps. The orange and black alternating triangles were cut from the papers used to decorate the banner I've made for the upcoming "Labor of Love Halloween* Hop" (*that's Hello-Scream, in case you didn't recognize the name). In fact, "true scraps" have another family word, this one originated by my Grandmother. GADRIBBLES. A gadribble is what's leftover on the cutting board when the Thanksgiving turkey breast meat is carved and presented on the platter. Or the "off cuts" of a piece of paper when your image is cut from it. Gadribble. Add it to the CardMonkey Glossary. Do you have a family language for certain words? Please share!